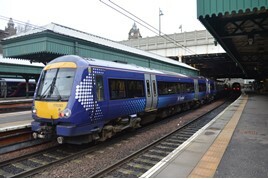 ScotRail is to implement all 20 recommendations from an independent review of its operations, with the aim of lifting performance towards Transport Scotland’s 92.5% punctuality target. Former TransPennine Express Managing Director Nick Donovan has spent the last few months combing through the way the alliance between ScotRail and Network Rail Scotland works. His recommendations cover both sides of the track and train divide. ScotRail Alliance Managing Director Alex Hynes said: “Nine out of ten ScotRail trains arrive within their target time, which makes us the best-performing large operator in the UK. But we know our customers demand the highest possible standards, which is why I commissioned an independent review into train service performance in Scotland. Asked if there was any priority order to the recommendations, ScotRail Head of Communications David Ross told RAIL that eliminating skip-stopping (where late trains miss stations) was already under way. He added that this was a symptom of wider problems, rather than an underlying reason. Local politicians have criticised skip-stopping. Donovan recommends that ScotRail Alliance looks at how to create more productive time in line closures (possessions). This reflects wider NR work that’s looking at how signallers and electrical control offices hand lines over to engineers. He suggests that managers check more carefully work done to critical items, to reduce the times they fail shortly after work. He calls for more work to discover the root causes of failures. 1. Review the way infrastructure maintenance is conducted to create more useful time by examining how possessions are set up, electrical isolations granted and the access and transit times for staff and equipment. 2. Eliminate infrastructure failures that occur soon after work by making better use of remote monitoring and making sure local section managers check work; in the short-term, increase checks on critical equipment after work. 3. Find the root causes of infrastructure failures, particularly those which have caused significant disruption. 4. Appoint a system engineer to lead the strategic development of intelligent infrastructure (remote condition monitoring), including interpretation of outputs and intervention alarms. 5. Review preparations for autumn based on historical evidence and also trends at particularly difficult places. 6. Review management arrangements in depots as fleets and maintenance contracts change, to provide teams with the tools they need to drive continuous improvement culture. In the short term, increase checks by local supervisors after work on a depot’s most critical fleet. 7. Improve fleet maintenance planning process to ensure a regular flow of work and efficient use of resources, and then measure the difference from the plan. Set improvement targets and monitor timely handover of trains to and from maintenance. 8. Assign clear responsibility for managing systems that straddle different areas, including engineering systems such as GSM-R radios and operational systems such as those that manage short-formation trains. 9. Review operational planning arrangements, including staff numbers, to cope with planned timetable changes and forecast staff turnover. 10. Build a ScotRail performance model that contains train and crew diagrams, to allow both to be tested against each other. This model could validate future timetables, test responses to incidents, and could include other operational constraints such as RETB token exchange times. 11. Urgently improve right-time departures from Whifflet station by ensuring there are no pathing conflicts in the timetable or in reality. Consider turning back trains closer to Whifflet (perhaps in Mossend Yard), or running in passenger service rather than empty stock from Whifflet to Wishaw and then returning empty. 12. Urgently improve right-time departures from Milngavie station, because analysis suggests this will improve performance across the network. Milngavie is the terminus for trains from Edinburgh via Bathgate and for Glasgow suburban services. 13. Review activity times across the network to account for local infrastructure limitations. Where times are not recorded they should be, so that they are not forgotten. Good knowledge of activity times might provide opportunities to speed timetables or justify investment to remove bottlenecks. 14. Improve access to live data to improve decisions, particularly access to P2 (an information system) to station co-ordinators, rostering and diagram planning tools to dispatch managers, and train plans to train crew supervisors. Benchmark best practice between major stations. 15. Suspend skip-stopping except as a last resort, and then only when planned before a train starts its service. Suspension should follow Whifflet and Milngavie work. 16. Create an operational delivery plan and recovery plan for Glasgow electric services so that they complement each other. Overall the plan should be simpler and allow isolated routes to run and increase the alignment between diagrams and drivers. 17. Find and ring-fence resources to develop and test different operating plans to deliver the timetable, balancing use of trains and crews with having a resilient plan that can be recovered following incidents. This allows current planning teams to concentrate on rolling stock cascades and infrastructure improvements. 18. Reinstate diversionary route knowledge for Yoker drivers on the main line and Bellshill routes to Motherwell. Consider increasing route knowledge of diversions at other depots. 19. Disband and restart current performance control room arrangements to provide a new mandate to concentrate on system performance improvement. Reset the performance executive meeting. 20. Review the tools and processes available to the performance management team. Remove redundant key performance indicators (KPIs) and make accountability for KPIs clear. For the FULL story, read RAIL 850, published on April 11, and available digitally on Android/iPad on April 7. As a resident of Helensburgh and regular user of North Clyde electric services, I applaud this report and look forward to seeing an improvement in performance. The pinch-point between Hyndland and Partick necessitates trains presenting themselves on time in both directions. I hope the efforts to start trains on time from Whifflet and Milngavie goes towards addressing the many sub-threshold delays that quickly accumulate. From my experience with the semi-fast Helensburgh to Edinburgh trains, the number of stopping services that run via, originate and terminate at Dalmuir through either Singer or Yoker, and the delays imported to the North Clyde routes from south of the river, all contribute to the need for skip-stopping to try to recover time. This congestion and slack running also impacts the West Highland services, which have to thread through the stretch between Westerton and Dalmuir and are often delayed. Heading from Glasgow, this regularly sees trains several minutes late leaving Dalmuir with knock-on delays at passing loops beyond Helensburgh. Increases in train frequency in recent years highlights the false economy of singling junctions (Bellgrove and Westerton remain cases in point) when the Yoker signalling scheme was introduced. This does not help punctuality or reliability of services.